B.B. 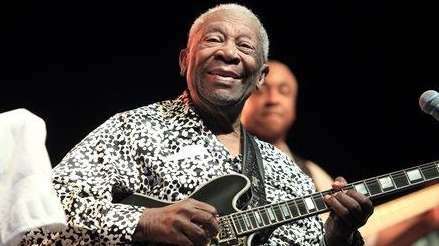 King, whose wailing guitar and warm but weathered voice brought Mississippi blues to the world in classics like "The Thrill Is Gone" and "My Lucille," died late Thursday in his Las Vegas home. He was 89. King died peacefully in his sleep at 9:40 p.m. PDT, according to his website. Clark County Coroner John Fudenberg and King's physician, Dr. Darin Brimhall, confirmed the death to The Associated Press, adding that he died of a series of small strokes. King had long suffered from diabetes, even becoming a spokesman for a blood sugar monitoring device in recent years. However, in the past year his health declined, and he collapsed onstage during a Chicago concert last year from exhaustion and dehydration. On May 1, King's website announced that he was in hospice care at his home and thanked fans for their prayers. King was the most-celebrated bluesman ever, his influence seen in the decades of sold-out concerts and numerous high-profile collaborations, including several with Eric Clapton and U2. In 1987, King was inducted in the second Rock and Roll Hall of Fame class. He received the Kennedy Center Honor in 1995 and the Presidential Medal of Freedom in 2006. He won 15 Grammy Awards, including best male R&B vocal performance for "The Thrill Is Gone" in 1970. "He was a beacon for all of us who love this kind of music," Clapton said in a video tribute he made after hearing of King's death, encouraging people to find King's 1965 album, "Live at the Regal," which is hailed by many as the blues' best live album, and Clapton said is "where it all really started for me as a young player." Riley B. King was born on Sept. 16, 1925, to sharecroppers Albert and Nora Ella King on a plantation in Itta Bena, Mississippi. As a child, King went to work on the plantation as well. But during his free time, he learned to play guitar and began playing on street corners for dimes, sometimes going to four towns in a night. When he turned 22, King hitchhiked to Memphis to play the blues and live with his cousin Bukka White, a bluesman himself. In 1948, he landed a spot on Sonny Boy Williamson's radio show, which led to steady gigs around Memphis and soon a radio show of his own. He became known as the Beale Street Blues Boy, which was shortened to Blues Boy King, and later, B.B. King. King was playing a dance in Twist, Arkansas, when two men got into a fight and knocked over a kerosene stove that set the hall on fire. King ran out to safety with everyone else, but when he realized he left his $30 acoustic guitar inside, he rushed back in to retrieve it, narrowly escaping death. When King learned the fight was over a woman named Lucille, he named his guitar Lucille to remind himself to never do a crazy thing like that again. King and his Lucille guitars became one of music's most recognized pairs -- an outgrowth of King's unique style of call-and-response performing. In most of his work, King generally sings a melody and then plays a guitar solo on Lucille that answers that melody, creating a musical conversation between King and his guitar. That conversation went on for decades, as King became more popular and more respected. His name became synonymous with the blues, giving birth to the B.B. King Blues Club & Grill near Times Square, as well as other clubs bearing his name in Memphis, Nashville and Orlando. King celebrated his 75th birthday at Jones Beach, headlining the B.B. King Blues Festival in 2000. He charmed the audience, as he so often did, by leaning back in his chair, shutting his eyes and playing a wrenching solo on Lucille, smiling ear to ear as he did it. It was those moments -- and he had a few when he headlined the Great South Bay Music Festival last July, which was his last Long Island appearance -- that kept King on a relentless performance schedule that would trouble singers half his age. In 1956, he played 342 shows. In 1989, he spent 300 days on the road. That kind of schedule took a toll on King's personal life, resulting in two divorces. According to The Associated Press, he had 15 biological and adopted children and family members say 11 survive. However, King made friends wherever he went. "The blues has lost its king, and America has lost a legend," President Obama said in a statement. "Three years ago, Michelle and I hosted a blues concert at the White House. I hadn't expected that I'd be talked into singing a few lines of 'Sweet Home Chicago' with B.B. by the end of the night, but that was the kind of effect his music had, and still does. He gets stuck in your head, he gets you moving, he gets you doing the things you probably shouldnat do -- but will be always be glad you did." In 2006, King told Esquire that his favorite song wasn't one of his own. It was "Always on My Mind," done by Willie Nelson. "If I could sing it like he do, I would sing it every night," he said. "I like the story it tells. It go, I may not have written you -- he's talking about a lady -- when maybe I should have. Or maybe I didn't take you to dinner, didn't call you when I should have, or didn't love you as I should have. But you was always on my mind. I felt that way a lot in my life. I think every person feels it." King said, "That's one of the things about being an entertainer. What we do -- it's just sharing the thoughts that many people have. You go to see a movie, and you sit up and cry -- it's because something is happening in there that just done happen to you or somebody you know. It's the same thing with what I do. Don't matter if you're gay or straight, black or white, you still have the same problem. It's love. It's universal."